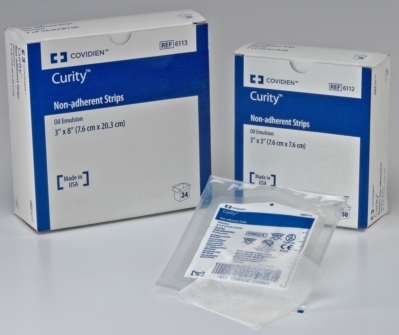 Curity™ Non-Adhering Dressings have an oil emulsion blend impregnated into open mesh, knitted fabric dressing. It is ideal for donor sites, delicate suture lines, graft sites, and draining wounds. The highly absorbent fine mesh gauze allows free drainage of exudate away from the wound. The unique oil emulsion blend is non-adhering to the wound site and reduces pain and trauma during dressing changes. The durable construction will not shred or unravel when trimmed to size.